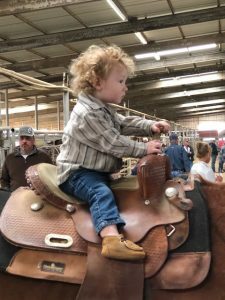 June and April and I travled up to north Texas, to Bowie (pronounced BOOwie), near the Red River, to a well-known horse auction barn. April needed horses for her camp string — she was looking for old, gentle horses for kids— and I also was prepared to buy something if it looked sound, and then Nancy, our friend who was thrown off her dressage horse and broke her thigh, needed an older gentle horse to get started riding again so April said she would buy something for her — she couldn’t come. She still walks with a cane. June came along for the fun of it. 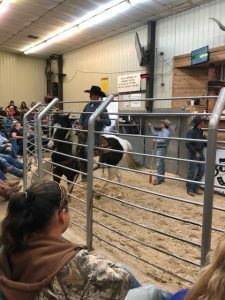 The auction and all its activities were really interesting to watch. The whole thing was fascinating. April driving. This was her diesel truck and a three-horse slant trailer. 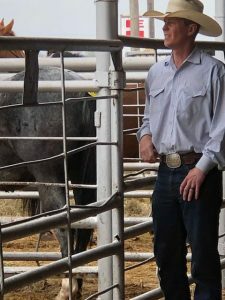 The auction barn is owned by David O’Dwyer, a great horseman. We came the day before and looked around and walked the catwalk above. 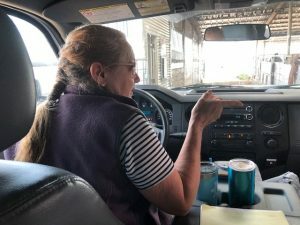 When the auction started they began driving in the horses. 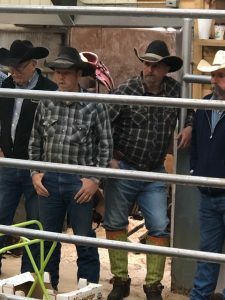 They were saddled up and the barn riders rode them in the auction ring, which was a really tiny space. 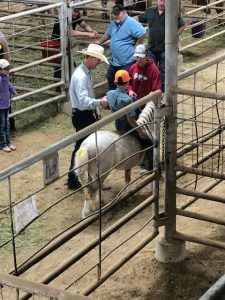 Other barn riders cut loose horses out and ran them up to be saddled. This barn rider really knew how to use that flag. This in some way fits into the new book because Simon was raised in a livery stable and was a barn rider and all-around worker and learned his fiddle on the side until it took over his life. A lot of interesting people wandering around looking at the horses, prospective buyers. Also lots of kids. Here’s a proud dad and his daughter. And kids all over the place. 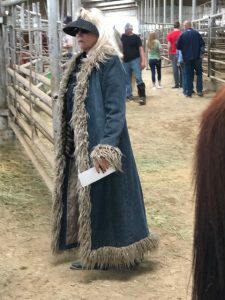 April and June and I walked the catwalk to get a good view; while up there April looked down and saw a seller inject his horse with something, probably Ace or one of the other horse tranquilizers, so he could sell it as a calm and gentle horse. This is despicable. Take the horse home and the sweet gentle thing breaks in half and you’re on the ground. This made me really reluctant to bid on a horse at all, no matter how good it looked. 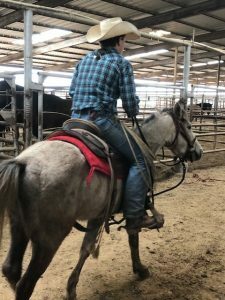 But O’Dwyer is a good man and trustworthy; saw a horse I liked and April said, “Let me talk to David about it.” David said, “Don’t trust that guy.” If I ever bought a horse there it would be with David’s advice and approval. 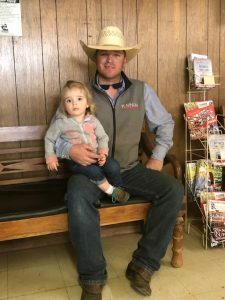 So if you want to sell a horse or horses, you pay a small fee to the auction barn and also a fee for a stall for a night or maybe two nights. 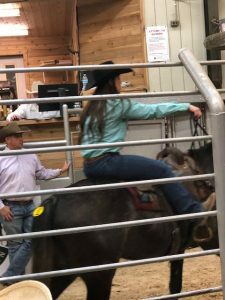 Then a barn rider takes it into the ring and shows it off while the auctioneer roars out his patter. 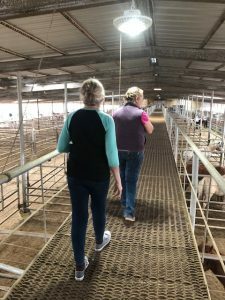 They say, ‘no alley deals’, meaning no private deals in the alleyways because after all the barn has to take its cut or it wouldn’t make any money and it would close. 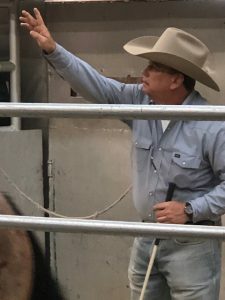 Also, the barn owner (David O’Dwyer, from Ireland) has a selection of stock that he has bought, worked with and will sell in the auction ring. 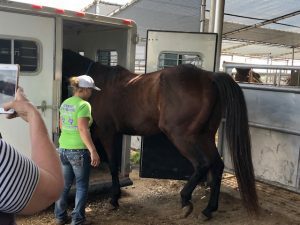 There was a big trailer load of ranch horses that came down from North Dakota. Everybody watches closely as the horses are ridden in one by one. A sign overhead says the Lot #, and also ‘Sound’ or ‘As is’, meaning, guaranteed in good health or Take Your Chances. 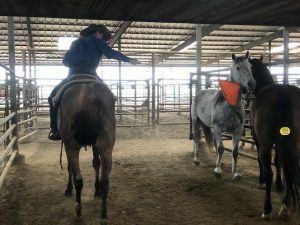 The girl barn riders seemed to have developed a fashion for elegant hand gestures when reining. They were great to watch. Terrific riders. 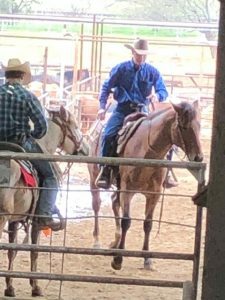 The one on the right is sitting behind the saddle to show how broke he is. 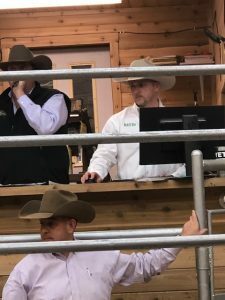 Up beside the auctioneer O’Dwyer keeps an eye on his laptop as several people were bidding online and watching online. Our friend Evelyn was watching online and was e-mailing us and could hear us chatting! The auctioneer would cry out the price, the assistant gestures for bids, and the auctioneer would often say, “And Online bids…” so much. 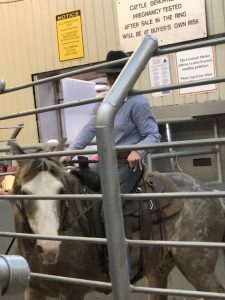 One goodlooking horse went for about $7800, there were others that were absolutely beautiful but there was no telling how they would be to ride so I sat on my hands. 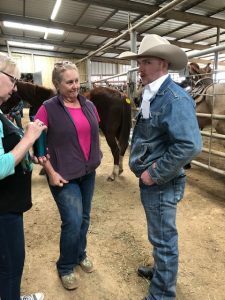 April endured seven hours of that loud auctioneer’s voice blasting out, but I couldn’t take it and sort of came and went. April bought a huge tall old Thoroughbred for Nancy, and that is going to work out great. The old boy needs a good home and an easy life. 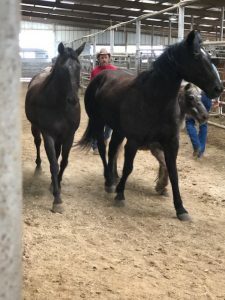 She also bought two other older horses, and again, there at the camp they will be very well taken care of and enjoy an easy old age. 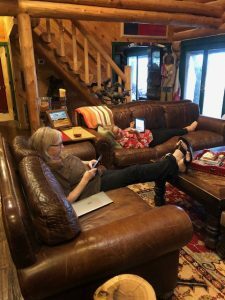 We stayed with June Chism’s husband’s people who have a beautiful home just outside of Nocona. We had the place to ourselves as they were gone on a trip to Italy. And so the next day they turned out all the unsold horses and they were glad to get back to open spaces. 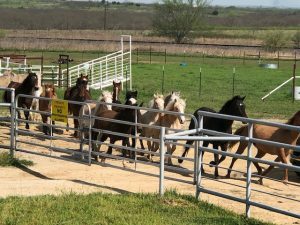 We loaded up the bought horses and came home, about five hours, eating junk food all the way and enjoying one of the greenest springtimes I have seen in Texas. 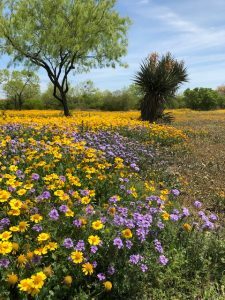 Wildflowers everywhere. 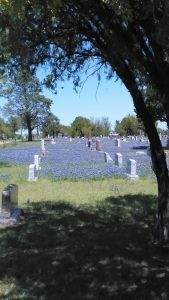 Bluebonnets near Nocona, town cemetery. This was south of here in the brush country, just east of Uvalde, last week, when I drove in to do my shopping. This entry was posted in News on April 12, 2019 by admin.